This will be a repeat of last year’s fantastic New England Style lobster dinner fund raiser to support the work of Imani Garden. 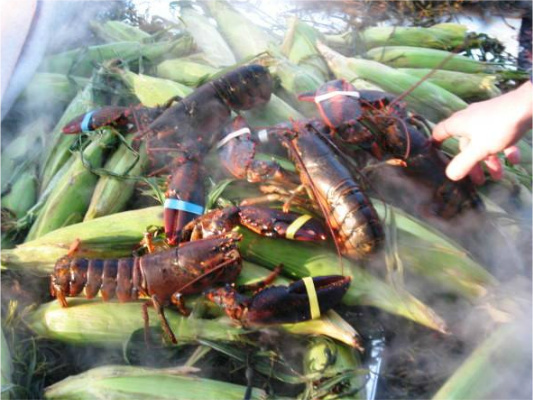 On Saturday, October 8th, The Imani Garden Volunteer team will be steaming lobster outdoors on a bed of seaweed along with fresh corn on the cob. They are getting the lobsters fresh from Maine the day before the event! Dinner will include, in addition to lobster and corn, potatoes and greens. Handmade beverages will be available for an additional charge. Drawn butter will be available to make your lobster mouth- watering delicious. The price for all this: just $25 if you pay in advance. They are capped at 100 dinners, so order now! If you wait, not only do you risk not getting a lobster, you will have to pay $30. For those vegetarians among you, you can get everything but the lobster for $15 if you pay in advance, $20 at the door. Please note: all reservations must be made on-line. If you do not have access to a computer, call us at (718) 496-5139. Imani Garden is located in Crown Heights on the corner of Schenectady and Pacific Avenues. Don’t forget to bring some treats for the 50+ chickens they have roaming around, too!! !